Color(s): Beautiful colors, reds, creams and goldens. The Goldendoodle is a family oriented dog like that of the Golden Retriever providing it is over 25 pounds in genetic body weight. Smaller Goldendoodles tend to pick up the traits of the Toy Poodle where temperament is concerned. The Goldendoodle is not a hunting dog but does enjoy outdoor sports and activities. The Goldendoodle is a non-aggressive dog who is other pet and children friendly. The Goldendoodle is a cross between a purebred Poodle and a purebred Golden Retriever. 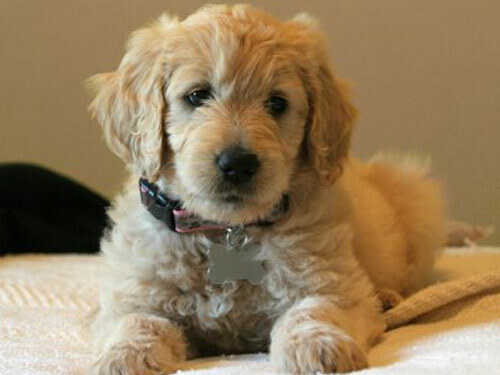 Goldendoodles can also be created by breeding a Goldendoodle to a non-related Poodle if the breeder is trying to achieve various coat colors. Shedding is minimal with first generation Goldendoodles. The Goldendoodle is a dog who enjoys being active with its family but is also happy to be an indoor pet as well. The Goldendoodle's purpose was originally for a low shedding assistance dog. Genetic issues are at a minimum but can be prone to dry skin and food allergies like that of the Golden Retriever. The Goldendoodle has a long, thick coat and can sport long or short ears that hang downward. The Goldendoodle sports a full facial beard as an adult. The Goldendoodle is considered to be fully grown at the age of one year and is a very family oriented canine. The Goldendoodle's tail rides high up over its back and has a full plume. Their facial expression always makes them appear to be smiling. The Goldendoodle does not require much grooming attention. Like many poodle crosses, most Goldendoodles are light to non-shedding, and most live easily with families with MILD allergies. A Goldendoodle has two types of coat. Shaggy and wavey or Shaggy/wavey with loose curls. A Goldendoodle should not sport a curly coat like that of a purebred Poodle or a flat coat like that of a Golden Retriever. The Goldendoodle will go through 10-15 various coat changes and phases from the time it is born until the day it turns one year of age. The Goldendoodle's coat does require maintenence once the coat has fully formed. The Goldendoodle has a single coat that sheds very lightly. The Goldendoodle is very eager to please and enjoys learning. Positive reinforcement, Consistancy and repetition is the key to successful training. Goldendoodles do not respond well to harsh training methods. Goldendoodles enjoy being indoors and outdoors and should be walked at least several times a week if it does not have a fenced yard to romp in. Goldendoodles enjoy swimming if it is trained at an early age to enjoy water.